Want to dip a toe in the waters of smart home lighting? Want to dip a toe in the waters of smart home lighting? This pack of four bulbs with control hub will let you get a taste of what you can do, by letting you choose what temperature of white light you want, or step it up a notch by choosing from 16 million color options. They're app-controlled, so you can use your smartphone or tablet to dim lights, set up a schedule, or turn them off and on. They seem even smarter when you realize how energy-efficient they are — each bulb lasts approximately 25,000 hours, so you can go years without having to replace one. These E26 bulbs — which share a standard form factor with Philips Hue A19 bulbs — work and play well with other Philips Hue products. Once your system is in place, you'll control your new smart bulbs through the free Philips Hue app (Apple®, Android™). Hue bulbs offer a wide range of adjustable white light. Choose a comforting, warm yellow light in the evening as you wind down, or motivating, bright white light in the morning. When friends come over, tap into the millions of different colors this bulb can deliver. Paint your walls with a vivid light show, or sync your lights to music, games, or movies for an immersive experience. 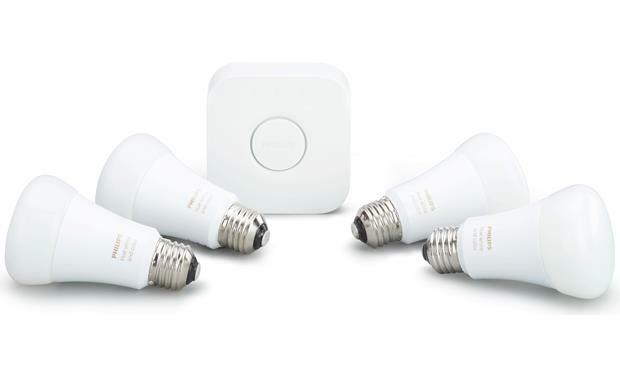 You can have up to 50 bulbs in your Hue smart lighting system. Mix and match these bulbs along with other Philips Hue smart lighting products to customize your personal lighting system. Are these the 3rd generation,the E26 bulbs? They are the latest generation and the standard E26 bulb size, yes. Overview: The Philips Hue White and Color Ambiance Starter Kit (#471960) consists of four Wi-Fi controllable LED white and color ambiance bulbs, and a wireless bridge. With these items, and the free Philips Hue app, you can control the lights wirelessly from your smartphone or tablet. The Philips Personal Wireless Lighting System allows you to set up light schedules, and control the lights when you're away from home. You can even change the color of the lights to match your mood. Additional Hue products can be added to the system, up to a maximum of 50 bulbs and 12 Hue accessories that can be controlled by a single bridge. Light Bulbs: The four LED white and color ambiance bulbs included in this Starter Kit can be used in standard light sockets (Edison screw base). They have an A19 form factor, and are 2.4" at widest point and 4.3" tall. The bulbs are rated at 10 watts and 800 lumens, and have an estimated nominal lifetime of 25,000 hours. Inside the bulb is a wireless interface that allows you to change the color temperature of the light from warm to cool daylight (2000K to 6500K), and choose from up to 16-million colors. The internal software is automatically upgradable when connected to the Philips Hue bridge. The bulbs have a beam angle of 160° (±20°), and instant 100% light output at startup. Note: The bulbs are not suitable for use with external dimmers, photo controls, occupancy sensors, or timing devices, and are designed for indoor use only. Bridge: The Hue Bridge 2.1 is the heart of the Philips Hue system, and can be wall-mounted or placed on a desktop. It connects to your router via the included Ethernet cable, and communicates wirelessly to your smartphone or tablet and the Hue lighting products. It operates on the 2.4GHz band (2400-2483.5 MHz), and Zigbee Light link protocol, and comes with a AC adapter. Dimensions: Width 3.521", Height 3.515", Depth 1.063".